In December 2011 I posted a story that a colleague and I had written together about a bizarre phone call I received at work one afternoon (that story can be read here). Briefly, in December a PA state trooper named Mark Pizzuti called to tell me that he was arresting a source of ours for making a false statement against a certain character we were looking into. The phone call was odd for several reasons, mainly because the source herself didn’t know she was being arrested (we actually broke the news to her when we asked for a comment) and because it was a huge breach of protocol. I work in an office with five veteran editors who all said they’ve never heard of a police officer calling a newspaper unsolicited to tip them off about an arrest they’re about to make. 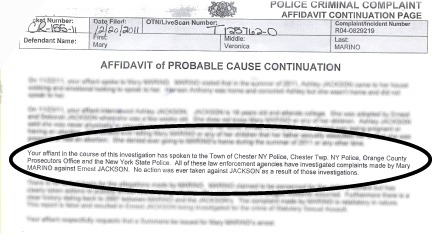 We obtained the affidavit that Pizzuti filed against our source and were struck by one passage in particular where he claims to have spoken with four law enforcement agencies in NY who cleared the character we were looking into of any wrongdoing (the same one our source was making allegedly false statements about). An excerpt of the affidavit used to arrest one of our sources that was later proved, at least partially, to be false. We then FOIL’d all four agencies Pizzuti claimed to have spoken with, asking them whether or not they looked into this character. Two of them, who we had trouble getting information from on this in the past, refused to answer us. The other two said that they never investigated this character. The sauce is thick on this particular story. What all this means is that a source of ours was arrested based on claims made by a police officer that were proved, at least partially, to be false. Yet our source still faces the same charges she did when our story broke. Read the update here as it appeared in The Chronicle on April 13.
interesting story that raises some very serious doubts about the integrity of pa. trooper mark pizzuti and why he is motivated to risk his own professional credability. I believe Brian your onto something here. I follow Dan often and came across this. It leaves more questions than answers. I find it disturbing and ominous about the justic in the State of Pa. Has this trooper been investigated? With all the scandals with these Pa Troopers in the last couple of years, this is certainly provocative. Keep up the good work Dan.